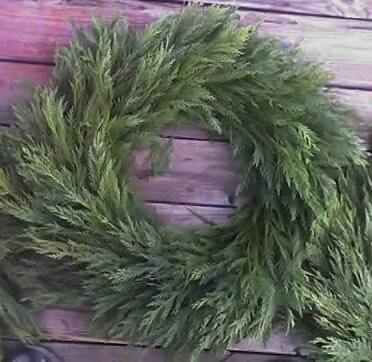 In addition to Christmas trees, we also have live wreaths, swags, and garland made from fresh Leyland and Murray cypress boughs. All these items are made here at the farm.We try to keep some on hand at all times .If you need large quantities, it is best to call ahead and place an order. Another unique item available is the Christmas cross made from greenery. They are beautiful hung on a door or wall at home. They would also be a beautiful remembrance to place in the cemetery. The red bow sets off the vibrant green foliage. The crosses are available with or without the bow. We also sell loose greenery when we have extra. We also have a selection of Christmas tree stands along with Christmas tree disposal bags and Christmas tree waterers.